Whenever I get to Edinburgh, no matter the weather, I try to make my first point of call the riverside walk along the Water of Leith. Of all the seasons here, Spring has to be my favourite. Stepping down from the street to water level, the fresh smells of spring are there to greet me. Here, it is the strong scent of garlic that wins over all others. For me, this smell evokes spring like no other and brings back back fond memories of other river walks, especially along the Wear in Durham, as a student. 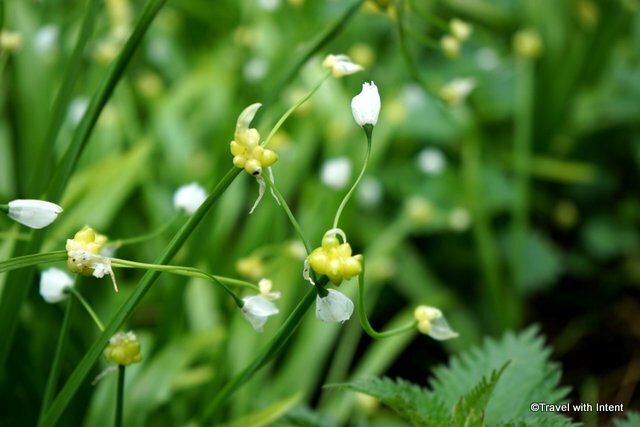 The banks here on the Water of Leith abound with these dainty white flowers and tiny yellow bulbils. 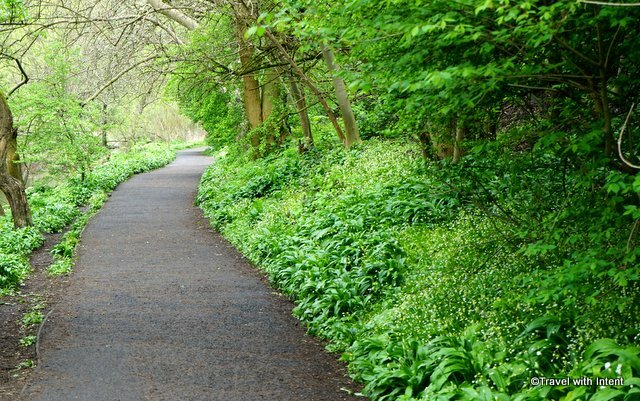 Wild garlic is native to Britain and often grows along river banks together with our beautiful bluebells. More often than not, though, the evocative garlicky smell comes not from wild garlic but from Few Flowered Leek (Allium paradoxum). It bears many similarities to garlic – it’s white, smelly and likes riverbanks – but this one is non-native and highly invasive. It grows so happily in these habitats that it forms a dense carpet that smothers other species; as a result it’s on the “wanted list” of the Wildlife and Countryside Act, which makes it an offence to plant it in the wild. I wish I didn’t know that: it seems too pretty to be a pest and now I won’t be able to think of it in quite the same way. Linked to Floral Friday, Scenic Weekends and Today’s Flowers. Beautiful tiny flowers! I am watching snowflakes flutter to the earth like tiny white butterflies at the moment. Spring takes its time here in NH, I’m content to have blossoms on my windowsill. That sounds rather nice. We didn’t really get any snow here this year. I would have liked to see some. That path looks very inviting. I’d love to go on a walk there. Now that’s a walk I’d like to do, Debs. 🙂 I think there’s been some regenerating going on up there and Leith’s quite a hot spot? Not sure if I could do it on a day trip but it must be worth an overnighter. I’ll think of you next time I’m walking the river banks at Durham. I must get back to Durham soon! A day trip might be pushing it. Depends how much of it you want to do. I haven’t done it all yet. I often do Roseburn to Stockbridge. Leith is pretty lively and has some great restaurants. Very beautiful photos. Thanks for sharing the info. I didn’t know about it and am sad to hear it’s become a problem. It’s a shame isn’t it, but it so often happens when we mess with nature. It’s indeed. The worse thing is that we humans tend to repeat the same mistakes with nature all over again. When we lived in Oregon USA there was a definite spring aroma along the riverbanks that we could never exactly identify, but it was how we knew it was spring for sure. Here in Florida I am always finding out that a pretty plant or an interesting animal is invasive and it is so disappointing. I know what you mean!